Carbon atoms cannot move fast via the lattice in between temperatures of A3 and A1. The formation of ferrite and pearlite depends upon permitting sufficient time for the movement of carbon atoms. It means such that transformation is possible merely beneath equilibrium condition. This may be realized that the edge of fcc cell is 23 percent greater than such of bcc cell. If a carbon atom is trapped in between two iron atoms so they are maintained apart and are not capable to take up the position in bcc cell. Carbon atoms in martensite involve the position on edge of unit cell among two iron atoms and hence elongate the edge and responsible for distortion. Figure of Comparison of Unit Cells of Austenite, Ferrite and Martensite Also Dimension are Compared at (d), compares austenite, ferrite and martensite unit cells at (a), (b) and (c) respectively. At (d) the edge size of martensite unit cell on that the carbon atom size is compared along with other edge on that there is no carbon atom. As a consequence a distorted lattice is acquired. It may be emphasized that these distortions resulting into regions of high strain energy would impede the dislocations movement whereby the material would lose its ductility or raises its hardness. Such trapping of carbon atom among atoms of Fe arise while the steel is not allowed to cool in equilibrium situation or in other words this is suddenly cooled from A3 to room temperature or to about 300oC. This process of sudden cooling from A3 is termed as quenching that may be attained by plunging heated steel as A3 temperatures into water or some other quenching medium. During this procedure the carbon does not comprise sufficient time to diffuse or carbon does not arise below a temperature 300oC thus a quench treatment whether temperatures is suddenly dropped from A3 to 300oC is sufficient to make permanent hardening in steel. If the resulting structure is examined beneath microscope it emerges to be needle like, often concerned to as acicular, and is termed as martensite. Various carbon contents will naturally result in various hardness. At low carbon stages there in hardness is extreme little change. The noticeable change in hardness is attains while carbon content is at least 0.4 percent and arrives at a maximum at eutectoid 0.8% composition. The hardness such can be achieved via martensite transformation at 0.4 and 0.8% Carbon are respectively 255 VHN and 530 VHN. The martensite formation also depends upon the rate of cooling. As the carbon content raise the critical rate of cooling becomes slower. The critical rates of cooling for plain carbon steels vary in between 400oC/sec and 500oC/sec. This means that it is not hard to harden steel containing 0.8 percent C than the one containing 0.4% C as also refers to figure of TTT Curves for Steel and Different Cooling Rates. Quenching in water results in best cooling rate and match to critical cooling rate for 0.35 percent carbon. It is not good for hardening. 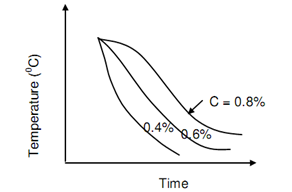 Figure of Critical Cooling Rate for various Carbon Content, demonstrated the critical cooling curves for several plain carbon steels.